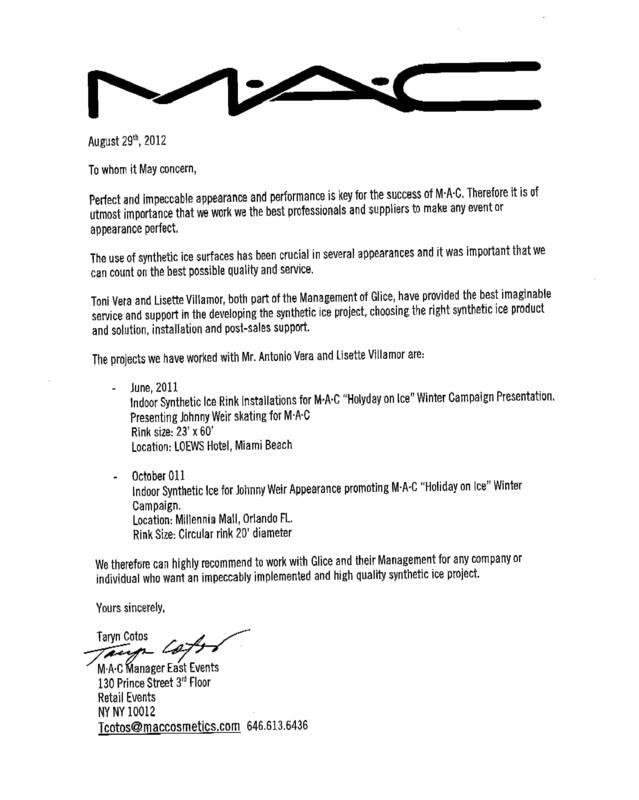 Glice® synthetic ice recommended by MAC Cosmetics! MAC Cosmetics East event manager Taryn Cotos has highly recommend any company or individual to trade with Glice® for impeccably implemented and high quality synthetic ice project! Below is the letter from MAC Cosmetics! Pertect and impeccable appearance and performance is key for the success of M-A-C. Therefore it is of utmost importance that we work we the best professionals and suppliers to make any event or appearance perfect. The use of synthetic ice surfaces has been crucial in several appearances and it was important that we can count on the best possible quality and service. Toni Vera and Lisette Villamor, both part of the Management of Glice, have provided the best imaginable service and support in the developing the synthetic ice project, choosing the right synthetic ice product and solution, installation and post-sales support. Indoor Synthetic Ice for Johnny Weir Appearance promoting M·A·C “Holiday on Ice” Winter Campaign. Location: Millennia Mall, Orlando Fl. We therefore can highly recommend to work with Glice and their Management for any company or individual who want an impeccably implemented and high quality synthetic ice project.